Kind Of A Big Deal? 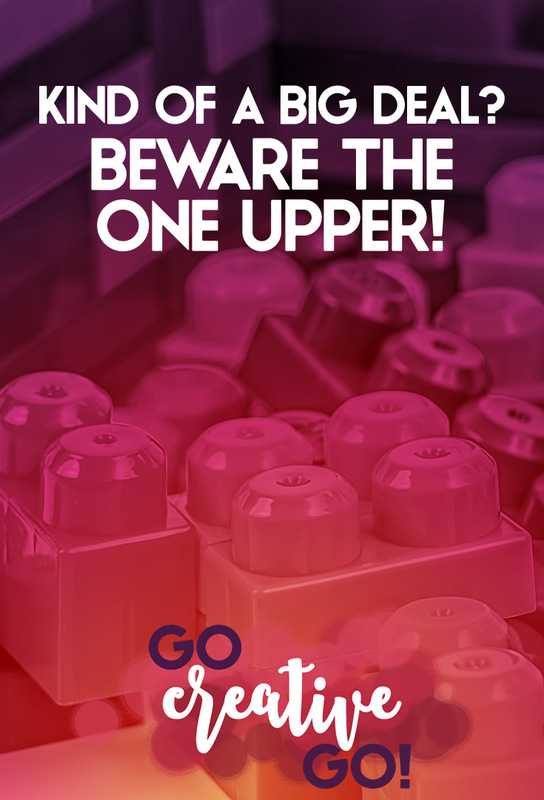 Beware The One-Upper! - Go Creative Go! Who me? Yeah. I’m kind of a big deal when it comes to my online presence. People share my stuff without even reading it, hoping to get into my good graces. I’ve got tens of thousands of followers, but I only follow the handful of influencers who are an even bigger deal than me. I share my own stuff all day, every day, 24-7-365 because there’s really no point in sharing some small-timer’s point of view, now is there? It doesn’t help my already substantial social standing, after all. I know that my frequent readers have already sorted out that the paragraph above is written with my tongue firmly stuck in cheek. But for any newer readers, SARCASM ALERT! Have You Met The “I’m Kind Of A Big Deal” Influencer? You have seen them online, even if you’ve been lucky enough to miss out on any of their online activity. One of my favorite big deal tactics, and yes, “favorite” should be in “finger quotes,” is online one-upsmanship. We see one-uppers in so many social settings. Amongst our friends, our colleagues, even amidst family members. But it’s amidst the influencer ranks that it becomes most rank and repulsive, in my opinion. One-upper marketers love to take their game to the opposing team. They’re intent upon maximizing their “big deal” status across the social space. Their goal is to one-up you on your Facebook wall, in your Twitter feed, on Pinterest, on and on, yadda yadda and etc. These lovers of the limelight are always one step closer to anything you choose mention or highlight in your own social space. Dare to boast yourself busy? They’re more busy. Finished a rebrand? They have too, and it’s been showcased far and wide across the Internet. Signed a new client? They just signed two – bigger names and for A LOT MORE money. Need I go on? Probably not. Sadly, we continue to see this kind of behavior taking up social space in our feeds. Of course this behavior isn’t new. It’s been going on for ages. I remember the first time I really noted the “big deal” bustle of a peer. I posted a fun little Q&A on Facebook – you know, back when you could do that and not get dinged for a text only post – but I digress, back on point. I asked my followers to share the first five tabs open in their browser. Most did so and it was interesting to see how, amidst the similarity, we were all a bit different. I even found a few cool new sites to bookmark. But… and you knew the but was coming, eventually the one-upper contingent had to rear a smug and snarky head. Indeed. Can’t answer the question because they are so hard at work with more than one browser open full of windows and tabs of “big deal.” See me sawing away at my violin in sympathy. SARCASM alert. I could have answered that I was working with browsers open on two different computers at the time, but engaging the one-upper is NOT the proper course of action. No, indeed. It’s crucial that you ignore the one upper. Both in person and online. One-upsmanship hunger is fueled by your response, prompting “big deal” braggarts to engage in even more annoying bouts of one-upsmanship. Let me add, it is perfectly A-OK hunky dory to roll your eyes violently while you are actively ignoring these folks. Just be careful you don’t add insult to injury by giving yourself a headache. How can you avoid the a one-upper moniker? Don’t fall into the same sadly lacking social behavior. Simply congratulate the person on their new brand or the landing of that new client. Do so without turning the conversation around to you. It’s NOT all about you. Social is listening and responding. Changing the subject and hijacking a conversation in order to toot your own horn is so NOT social! Design Discussion Keeps Projects On Track! Cheap Design: Cheats You & Your Brand!